Want to take your self defense skills to the highest level? 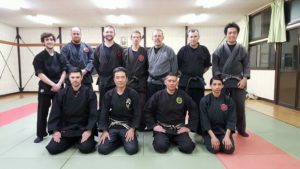 Check out our Bujinkan Martial Arts program, based right here in Birmingham, Alabama! Do you believe that worthwhile pursuits require dedication? Are you turned off by goals that are “too easy?” Do you want to stay physically and mentally healthy and active for years to come? Do you value sincerity and courtesy? And of course…taking your martial skills to the highest level of efficiency? This program isn’t for the hobbyist or weekend warrior who just wants to “take a couple of classes.” This program is for the person that wants to live the highest quality of life and is willing to put in the work to achieve it. Does this sound like you? If so, please keep reading. NOTE: If you’re looking to get rock solid fundamental self defense skills, but don’t have the time or interest for weekly training, please check out our Self Defense Courses. Success in Bujinkan Martial Arts is more about willingness to commit and persevere than it is about being in excellent shape or being a great fighter. Health and skill are a result of training…it’s your responsibility to show up for training! This isn’t your little nephew’s Tae Kwon Do black-belt-factory-franchise-school. This program is for adults like you. We purposefully limit our classes to a smaller size so that you receive the highest quality coaching possible. What are Bujinkan Martial Arts? You are going to learn the most comprehensive martial art system in the world! Employed through centuries of warfare on Japan’s ancient battlefields, these time tested arts are still being employed by many of the world’s leading military forces and law enforcement agencies. You will discover how to apply strikes and kicks, joint locks, throws and chokes, as well as groundfighting and various weapons as an integrated system to make you the most well rounded martial artist capable of handling any self defense situation. Speed, strength, and physical toughness are limited. They each fade with age and fatigue, or are dependent upon physical stature. With Budo Taijutsu, you’ll rely on skillful use of timing, distance, and balance to survive an attack. Distancing overcomes toughness, timing overcomes speed, and balance overcomes strength. Bujinkan translates to “hall of the divine warrior.” This means that you’re training for something greater than fame or fortune. You’re training to protect life. You’re training to become a better human being! Your training will focus on the study of traditional martial arts and how to translate that study into useful application of techniques for real world self defense scenarios. You will discover the fundamental mechanics, tactics, and strategies for physical self defense and martial arts techniques. You will also learn proper mindset and how to inoculate yourself to better deal with the stress of a real life attack. Additionally, you’ll enjoy the benefits of lowered stress, restful sleep, fat loss, muscular endurance and strength, improved stamina and energy, and simply feeling better throughout the day. You won’t stand in a line punching and kicking at the air. You will train dynamically with another person for realistic movement that you can actually use. You will gradually progress from fundamental techniques and tactics to advanced principles and strategies. Along the way we “pressure test” what you have learned so that you gain the confidence that comes with knowledge, experience, and accomplishment. Through challenging physical training, you will simultaneously train your spirit. You’ll discover how to better negotiate life’s little obstacles and distractions with less fear and stress. You’ll engage difficult tasks with enthusiasm rather than dread. This will certainly help you in your personal and professional life. Perhaps most importantly, you’ll find yourself feeling happier and truly enjoying life! These classes are an “on-going” program, and are open to all levels of committed students from beginner to advanced.